Dawar Shami is a traditional pully system that was used for pulling boats out of the sea. While one end of the boat would be tied to the boat, the other end would be fixed to the Dawar Shami. Strong men would then rotate the lever to pull the boats out. This can be viewed at the Al Fahidi Fort in Bur Dubai. 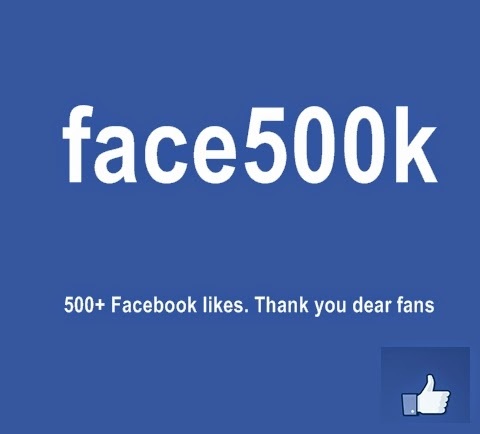 This is an old picture I discoved on my hard disk. This was shot at Dubai Media City (DMC). Surrounded by several tall buildings, is this serene spot and very popular spot at DMC. There is a narrow ramp that leads up to structure placed right in the middle of the water and is probably one of the most tranquil spots in Dubai. I have seen so many people spend peaceful moments at this spot. The general feeling of quite and peace at this spot can be great way to recover after that terrible day at the office. The sale of NOL cards started today. Only 21 days to go for the first metro train to roll out on 9th Sept. It will be interesting to see if people Q up to buy the NOL cards early. I think there will be early rush to get the cards as most residents will want to have the experience of using the metro. Even if they do not intend using the metro for their commute travel around the city. It may even become an 'evening out' event for some families for the next 1 - 2 months. But more importantly, I was one of the early customers of the NOL cards. I got mine this morning from the RTA registration office in Barsha. The picture above is my own NOL card!!!! Everything went on well. There were no surprises at the counter and everyone seemed to be well informed. The lady at the counter was well trained and it looked like she had got a structured training. She used a well structured explanation of the NOL card and the entire transaction was glitch free. The launch of the metro is probably one of the most important events in Dubai in recent years. Not for the glitz or the size (tallest/biggest) or for the attention it is getting across the world. 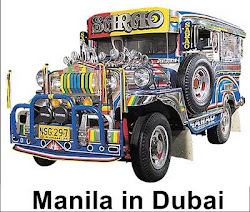 The metro I believe will have the strongest impact on Dubai. It will change the city and the way the city travels. It will change the way the development of Dubai evolves. I am excited about the long awaited introduction of Dubai Metro. Are you? Strongly recommended... the next time you need that grilled fillet of Kingfish, head down to Sharjah fish market. 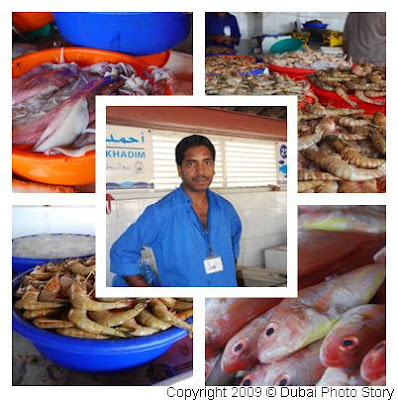 Located close to Rolla, the Sharjah fish market is an interesting experience!!. It is more traditional, without air conditioning, a little bit more messy and always very crowded (unless you make an early morning visit like I did). I have started liking the Sharjah fish market over the one in Karama. It has a better variety of fish, very fresh and most importantly a better price for most types of fish. Try out Sharjah fish market near Rolla the next time you plan for grilled tiger prawns at your weekend barbeque!. This weekend saw me making my way to Dragon Mart, the place to be in Dubai for bargains and deals. Serving as the gateway to the Middle Eastern markets for Chinese goods, Dragon Mart houses hundreds of Chinese retailers selling everthing one can think of (at least everything I could think of). From hardware to acoustic equipement and from home furnishing to shoes, you can find it all at Dragon Mart. It is bit of a problem if you don't have your own car to get down there as getting public transport to Dragon Mart can be a bit of a challenge. Here's what I purchased; a nice handy cordless drill machine, a few of the white plastic pipes to conceal the wires coming out of the home theatre system and a tap to replace one that has given way. The pride in his eyes could have moved mountains. I met Bak Munir Khan, an expatriate worker from Pakistan as he was celebrating Pakistan's independence day. Yom-e-Istiqlal (Pakistan Independence day) is celebrated on 14th August, the day on which Pakistan gained independence from British rule in 1947. 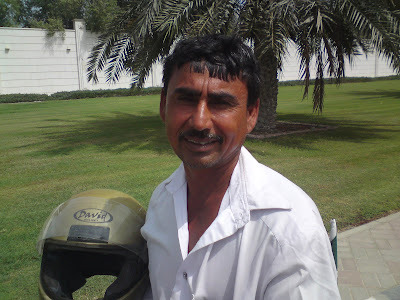 Bak Munir is employed with Sharjah Baladiya (municipality) where he attends to Sharjah's public gardens as a gardener. He was ecstatic when I complimented him on his beautifully decorated motorbike. He has placed several flags of Pakistan on the bike besides many green and white ribbons. I was surprised to find out that he had really no place to go but was only riding around Dubai on his motorbike to 'celebrate the important day'. As we spoke about his country, one could see the pride in his voice. Despite so many recent upheavals, he was hopeful of retiring and going back to a bright and prosperous Pakistan. Here's wishing all Pakistani residents of Dubai, Happy Independence Day. Its kind of strange that after all these years in Dubai, I had never been to the famous Jumeirah Mosque. 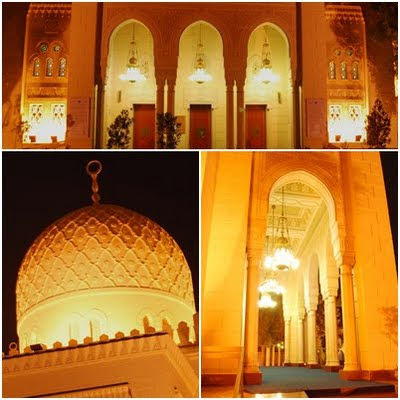 Jumeirah Mosque is extremely well known and is usually part of the normal tourist trail. I remember our relatives visitng us a few years back and being excited about seeing the Jumeirah Mosque. That we never got around to seeing it is another story. Located along the beach road, it is one of the largest in Dubai. Jumeirah Mosque was built along medieval Fatimid lines and is today probably the most photographed mosque in Dubai. It is also the only mosque opening to non muslims. Visitors who wish to visit the mosque need to join one of the Jumeirah Mosque tours coordinated by the Sheikh Mohammed Center for Cultural Understanding.